This position requires completion of the PA Entry Level Firefighter Program (or equivalent) and the Firefighter I Pro-Board Certification. If you have these prerequisites when joining us, you will serve a three-month probationary period, but will be able to function as an interior firefighter. Prior to being authorized to respond to calls, you will go through an orientation process, and must pass an examination on basic equipment knowledge, and our response policies. You must also demonstrate competency to wear SCBA. If you do not have the prerequisites for Interior Firefighter, you will start out as support or exterior firefighter depending on your level of training, and will have to complete the PA Entry Level Firefighter Program and Firefighter I to attain Interior Firefighter status. This position requires training up to Module 3 of the PA Entry Level Firefighter Program. Exterior firefighters do not enter buildings for structural firefighting operations, but can function in exterior roles such as placing ground ladders, operating exterior hose lines, and operating apparatus pumps. Exterior Firefighter is a journeyman position for those working towards Interior Firefighter status, but is also a role that can be attained for those who just want to drive and operate apparatus, and/or function in a little more of hands on role at incidents. New members that already have the minimum training requirements for Exterior Firefighter, also must go through an orientation and pass the exam to be cleared for call response. This is the entry level position for new members with little or no fire service training. In the support firefighter role, you will primarily provide direct assistance to apparatus operators. Helping hook up hoses, retrieving equipment, assisting firefighters emerging from the building are things you can expect to do at this level. New members can progress towards the Exterior Firefighter role by completing the first three modules of the PA Entry Level Firefighter Program. You are not required to progress to Exterior Firefighter, so you may remain at the Support Firefighter level for as long as you wish. To be eligible to respond to calls, support firefighters must complete an orientation, and pass an exam on basic equipment knowledge and response policies. This membership option is for individuals between the ages of 14 and 17. As a junior member, you can learn about the fire service, and participate in a certain level of fire training including up to the first three modules of the PA Entry Level Firefighter Program. Junior members may also help with various fire company events, and participate in a limited basis on calls. Applicants for Junior Membership go through the same process as other members; however, it is strongly encouraged that at least one parent participates in the informational interview. A work permit issued by the Junior Member’s school district must be provided as part of the application process. Upon turning 18, Junior Member status will be converted to regular senior membership, and the former junior will participate at either the Support or Exterior Firefighter level depending on the level of training completed as a Junior. This level of membership is for anyone that would like to volunteer their time with us, but has no interest in responding to calls. The list is almost limitless, but some ideas of ways to help in this role include: event planning, fire prevention programs, website maintenance, company photography, marketing, equipment maintenance. After your first year of active service as an Administrative Member, you will be eligible to run for elected positions such as board member, treasurer, secretary, vice-president, and president. Administrative Members go through the same application process as described above. Training is not required for Administrative Members; however, members at this level are encouraged to take Module 1 of the PA Entry Level Firefighter Program. This is a 16-hour course that provides a history and basic overview of the fire service. This membership option is for those operating at the Interior Firefighter level. Live-in members are provided a bunkroom, shower facilities, kitchen dayroom, and other station amenities rent free. In exchange for living at the station, you must be available to respond for calls a minimum of 48 hours each week, and participate in company training, and meetings. Current members are generally eligible to apply to the live-in program after meeting minimum training requirements. To apply for Live-in Membership, you must have a Firefighter I Pro-Board Certification, and PA DOH Basic Vehicle Rescue Technician Certification. You will need to follow the same application process as described above, and submit a letter of application to the Live-in program. If your application to the program is successful, you will serve a 90-day probation period where immediate dismissal is possible for failure to follow Company By-Laws, SOGs, or Live-In Program SOGs. We have facilities for live-in members at both our main station and sub-station. Priority is given to fill live-in dorms at our main station, but the Chief and Board of Directors reserves the right to assign live-in members between the stations in a manner that best meets the operation needs of the Company at the time. This membership option is for individuals who hold active membership with at least one other fire company. If you have an interest in helping to staff our stations or respond from your workplace in the Township of Pine on a casual basis, you can join as an Associate Member. To be eligible to apply, you must provide certification from the Chief of your home company that you are a member in good standing and have at least one year of service with that company. As an Associate Member, you may function at either the Support, Exterior or Interior Firefighter status, and must show that you have completed the minimum level of training for desired level of service. You will have to complete the orientation process, and pass the exam on basic equipment knowledge and response policies to be cleared to respond to calls. 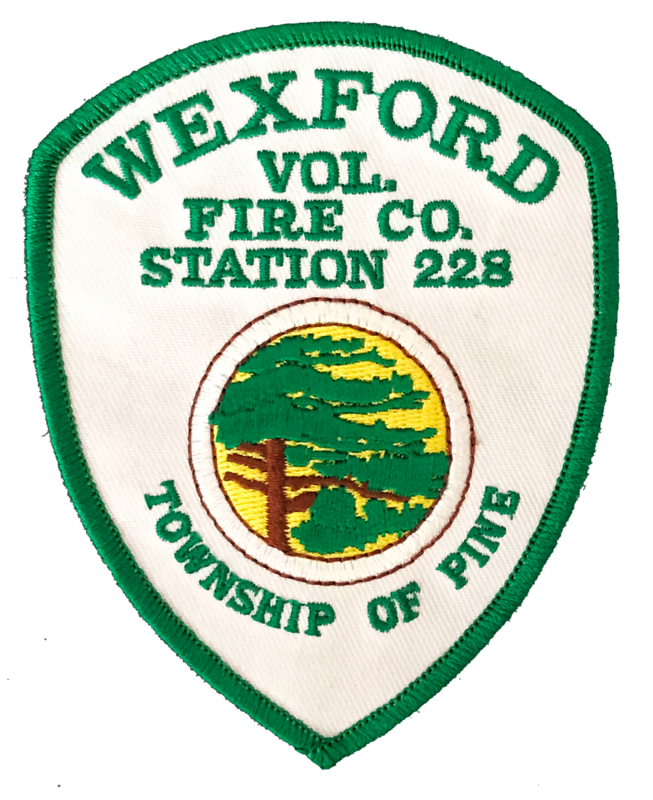 Associate Members are encouraged to participate in Wexford VFC training, but are not required to do so. To certify ongoing training, you simply need to provide proof each year from the Chief of your home company that you are completing training with them that meets or exceeds the annual training minimums required by the Wexford VFC. To remain eligible as an Associate Member, you will need to respond to at least 10 calls in a calendar year, or document spending at least two hours of time on station on ten separate days in a calendar year. Application as an Associate Member is through the same process as described above.